RCB reformed their teams totally and coming as a very strong contender for IPL Trophy. So decide yourself after looking at RCB New Team in IPL 2019 that they are stronger or not. RCB has always been favorite of most of the IPL fans. Having star players like Virat Kohli, Ab de Villiers and also they had Chris Gayle, RCB's stardom was much higher than any other team in IPL. But even after having these star player, RCB failed to cheer their fans. All teams are ready for the IPL 2019 and after Auction of IPL 2019, all teams reformed themselves buying some players. RCB retained their 15 players before the Auction that left them 10 spots for the Auction of IPL 2019. So RCB has added 9 players and in the upcoming season of IPL, RCB new team is coming with much more strength. RCB has a big experienced batsman like Virat Kohli, Ab de Villiers, Parthiv Patel and also they added some new talents to the RCB New Team list such as Shimron Hetymyer, Heinrich Klaasen, Himmat Singh. 👉 Caption Virat Kohli was retained by the franchise RCB, also Ab de Villiers was retained in RCB new team. So maybe Ab de Villiers can also lead RCB new team in IPL 2019. 👉 RCB has bought Shemron Hetmyer an added him to the RCB new teal list in IPL 2019. Shimron Hetmyer was one of the most expensive players in IPL 2019. He was bought by RCB in 4.20 crores. Hetmyer is an aggressive batsman of Westindies and believes in hitting big shots. 👉 RCB bought Akshdeep Nath by paying 3.60 crores in IPL 2019 Auction and added him to the RCB New Team list for IPL 2019. Akshdeep Nath is also an aggressive Indian batsman. 👉 RCB bought Heinrich Klaasen for 50 lacs who is a wicket-keeper batsman. So that is a good move looking to the Parthiv Patel was the only good wicket-keeper batsman. So if unfortunately Parthiv gets injured or RCB want to try new batsman, they will have an option. Moen Ali, Colin de Grandhomme, Marcus Stoinis, Washington Sundar, Pavan Negi, Gurkeerat Singh Mann, and the most expensive all-rounder Shivam Dubey. We all know that Moen Ali, Marcus Stoinis and Colin de Grandhomme are very well experienced all-rounders. 👉 RCB has a new name in RCB new team list which is Shivam Dubey. Shivam Dubey is an all-rounder player. He smashed 5 consecutive sixes just before a day of Auction IPL 2019, that's why RCB bought him for 5 crores. Shivam Dubey is a dangerous hitter. RCB's hand is full of well-experienced bowlers like Yazuvendra Chahal, Umesh Yadav, Tim Southee, Nathan Coulter Nile, Mohammad Siraj, Kulwant Khijoriya, Navdeep Siani. RCB is coming to IPL 2019 with a full combination of fast bowlers and spin attack. Taking an overall look at the RCB New Team in IPL 2019, they have everything to win the trophy like good batsmen, good captain, strong all-rounders, and bowlers. 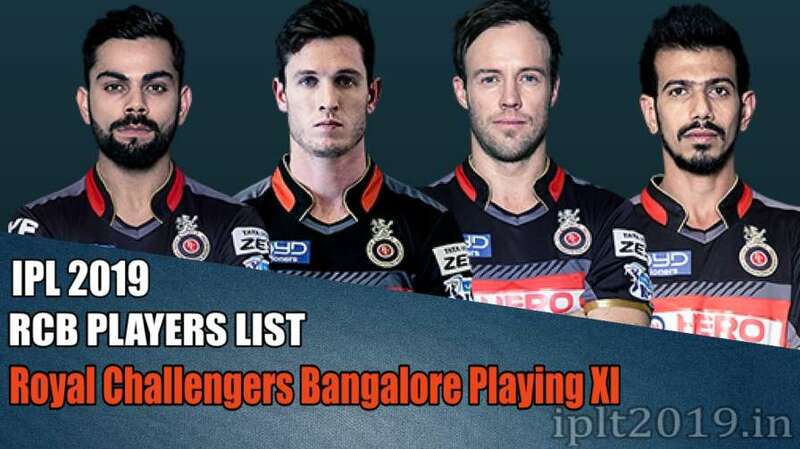 This must be quite interesting to watch the good combination of players, who will be the playing 11 of RCB new team. #1 Parthiv Patel is the first name which is fixed that he will be opening the team. #2 As 2nd opener we might see Virat Kohli also because of his performance in 2016 as an opener. So if RCB wants to get a hold on the trophy, they need to repeat this. So Parthiv Patel and Virat Kohli will open the innings. #3 On number 3 spot we can see their current buy Shimron Hetmyer, who will be smashing boundaries all over the ground. #4 On number 3, we will be seeing all time favorite and greatest of all AB de Villiers. #5 Shivam Dubey will be coming to number 5. RCB bought Shivam Dubey for 5 crores for the RCB New Team in IPL 2019. #6 On number 6th we will see Marcus Stoinis I guess. RCB traded Marcus Stoinis from KXIP and added him to RCB New Team in IPL 2019. #7 Pavan Negi will be playing at number 7. Bowling of RCB used to be a very poor side of RCB and also the reason behind their defeat. So the tailenders look good this year. #8 Tim Southee will be playing on the 7th spot. This is the expected playing XI of RCB new team in IPL 2019. Comment your own playing XI below.